Let's not pretend, that I didn't add this book to my TBR without reading the synopsis. The cover says so many things to me, and all of those things are things I love. But, going a little deeper. They have to save the park! Sounds exactly like my sort of book, and just reading the synopsis made me smile. 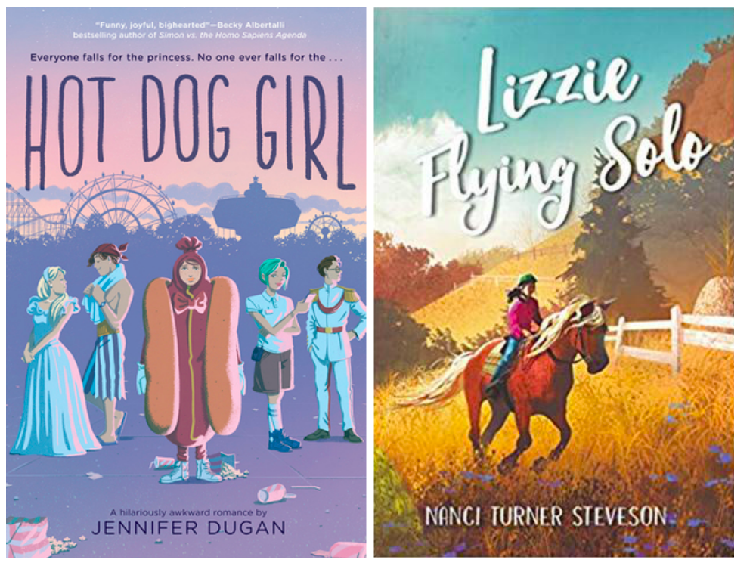 Lizzie just wants to keep her head down at Good Hope and her new school, so she doesn’t have to admit the real reason she and her mom lost everything. But when Lizzie finds herself at the nearby Birchwood Stables, some new friends—along with the arrival of a frightened pony named Fire—help Lizzie to open up and accept help from those around her, even if it means she’ll have more to lose if things change again. 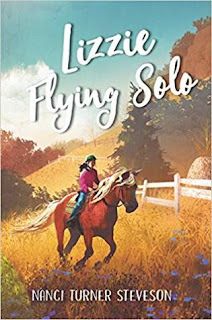 I have been reading more and more middle grades books, because we are getting so many stupendous entries in this group, and I feel like Lizzie Flying Solo will be yet another amazing middle grades read for me. I like that the author featured a family, who are homeless. This is something that many families experience, and I am always for increasing the visibility of this group. It's about facing change, which is something that is difficult for a lot of people (myself included). It gives me comfort to read about others successfully embracing changes in their lives. And, bonus! There's a pony. I am getting a lot of heartwarming feels from this book, and those are my favorite kind of feels. Yes to Hot Dog Girl! I mean the title and cover alone make me want to read this but sounds good too! When I saw the title on a list of 2019 releases, I immediately needed to know more, and when I saw the cover! Forget about it. The cover for Hot Dog girl is so fun!! I love it! It's too fun! And I must get a copy of this book, because I think the story will match the cover's greatness. I am known for my cover love, and those definitely caught my eye. I am all about the fun and whimsy and feel good, and think this will deliver. I'm definitely looking forward to Hot Dog Girl as well! I initially added it to my TBR because of the cover, but after reading the synopsis it made me want to read it even more. *high five* The cover is awesome! I like reading across age groups, and since the books are written by adults, the books always have something that I can connect with. Hot Dog Girl sounds like it is going to be a fun, cute read. A dancing hot dog? Got to love that premise. Who doesn't love dancing hot dogs? I have been hearing really great things about the book from early reviewers too. No!!! You added a book just because of the title and cover? LOL I'm very guilty of that too. Both of these sound fun and I hope you enjoy them. I am such a cover-ho, and for the most part, my instincts have served me well. Nice picks! Totally new to me ones but as usual, I hope you enjoy these once you get a hold of them! Hot Dog Girl sounds so fun! Hope you love it! It sounds fantastic! I hope I get a chance to read the book. 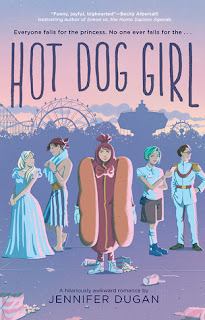 I'm pretty sure I would have added Hot Dog Girl to my TBR just for the cover, lol, but the synopsis sounds great too. I instantly wanted to read this book even more when I saw the cover on Twitter. I am getting funny and warm feels from this one. I haven't heard of either of these, but Hot Dog Girl sounds adorable! I love the whole working in the amusement park, while also trying to save the park. If summer job doesn't SCREAM summer, what does? The cover of Hot Dog Girl made me smile. Summer books are so much fun! And also, I used to read so many horse books when I was young which is so weird because I don't actually love horses? But I am sure you will enjoy it! That cover is the best. It is amusing and fun, but you can tell the MC comes off a little sarcastic, which is someone I could really connect with. I rode a horse once, and it was terrifying. I might have to pick up both of these. Great picks! I am hoping my library gets them, because I can tell I will love them both.